June 12, 2015 Leave a Comment Written by Julianna C.
Hi everyone! 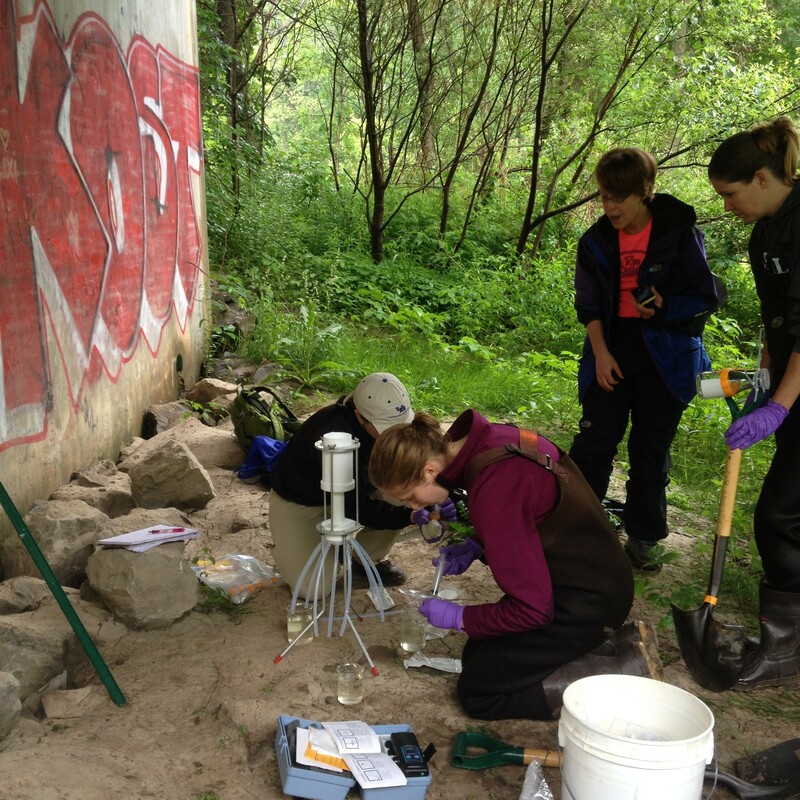 Over the last two weeks we have been busy getting our research teams together in order to set up our summer projects. Here are some updates on how things are going for each of the teams. We were out in the field this Tuesday to get some stream gaging done at Tonawanda and Rush Creeks. 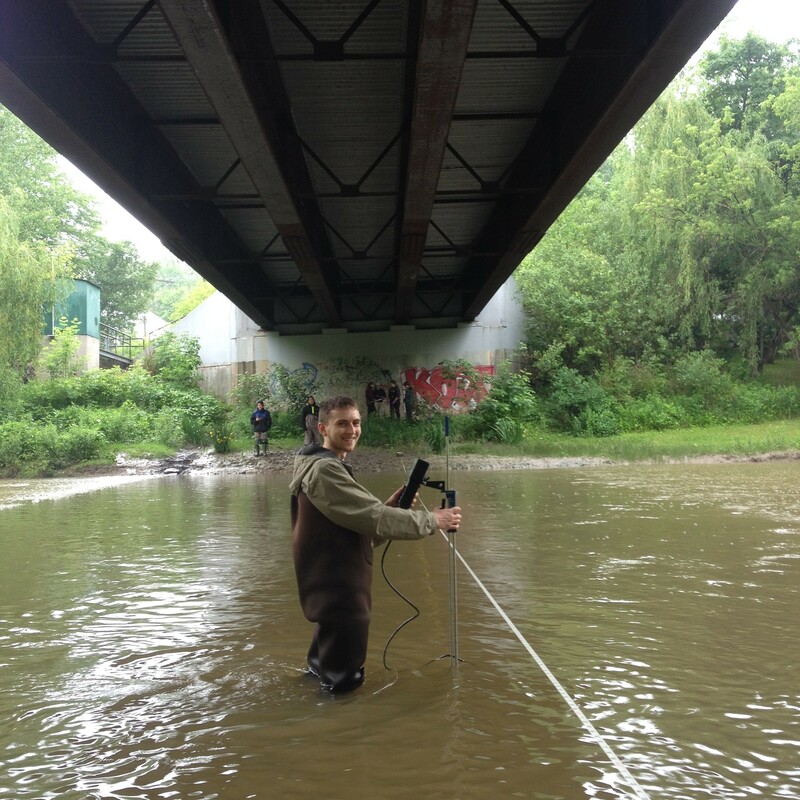 Weather conditions were a little rough with persistent rain and high creek stages but we figured out a pretty sweet workaround at the Tonawanda site: gaging underneath a bridge! 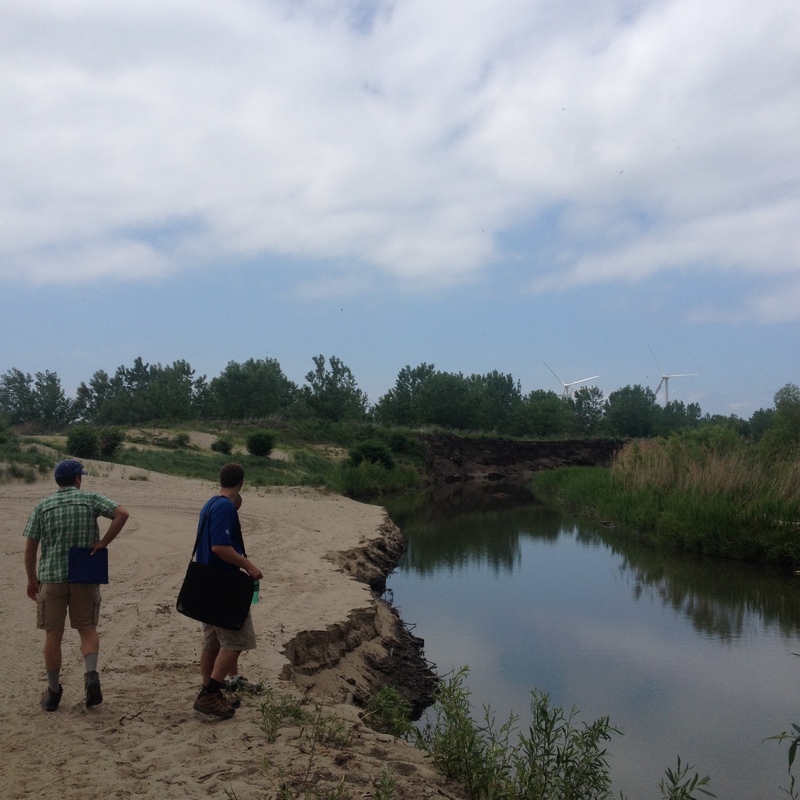 We are gaging 10 major tributaries to Lake Erie this summer to get a sense of how much water is flowing into the lake from each area. 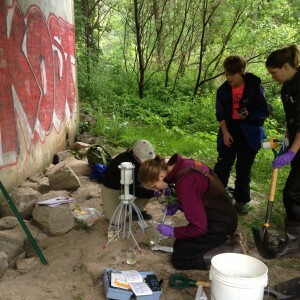 We also had Dr. Allen-King’s team with us taking samples for their water quality study. 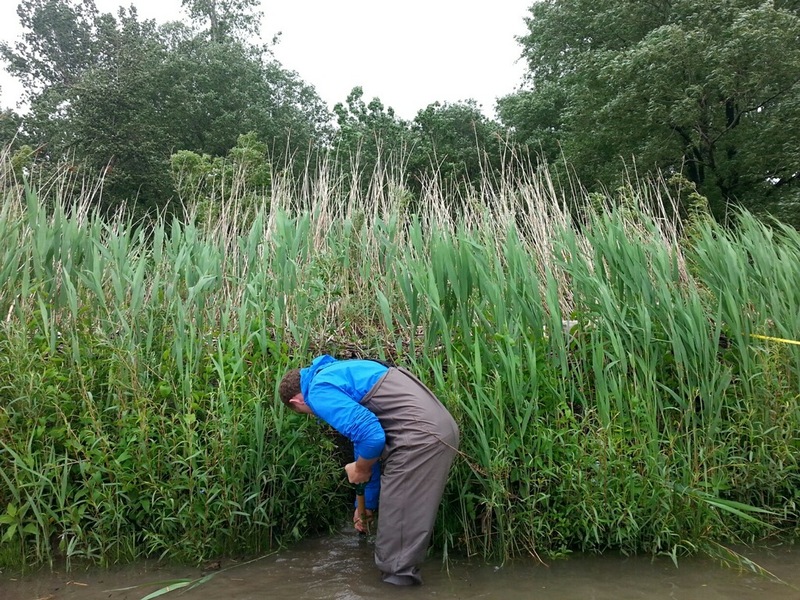 and trying to find a location for a CrowdHydrology gaging staff. Pretty soon it started raining again so we worked quickly to get finished. We’re good to go at this site and will be back next week to collect some data. Thursday we did a test run of our equipment in UB’s Lasalle Lake. 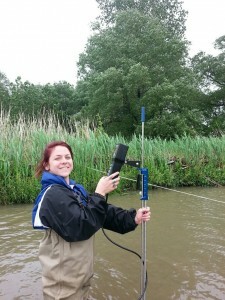 We used our YSI multiprobe to test pH, conductivity, and water temperature at 50 points throughout the lake. One of our team members, Jay, was able to map the data in ArcGIS once we were finished, and it looks great! 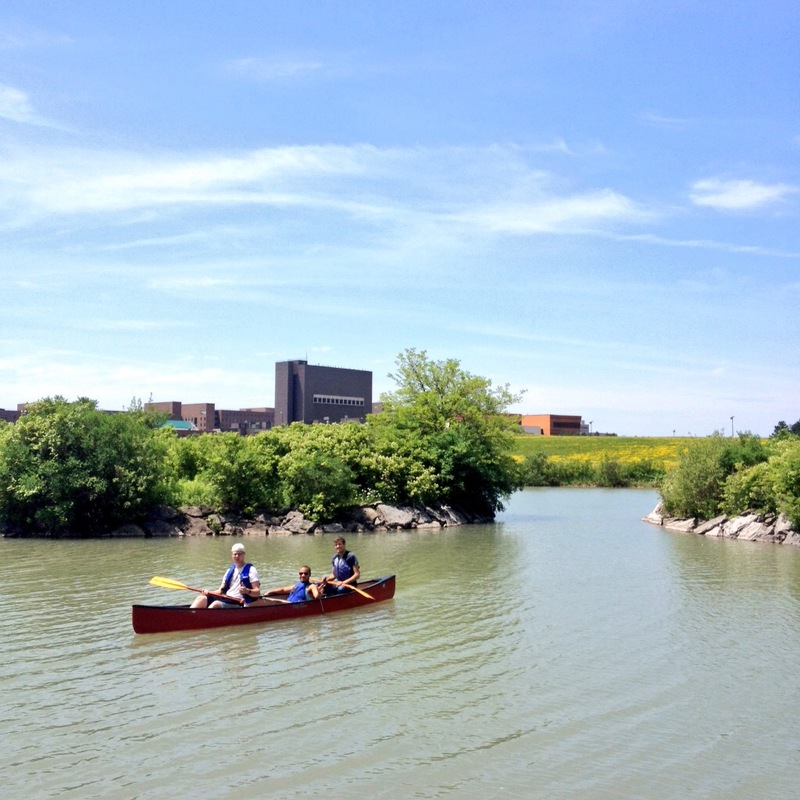 Next week Jay and John will be out on Ellicott Creek doing testing along the whole length. We are still waiting on some equipment for Team Turbidity but next week they will be meeting with an area sailing club. We will be supplying kits for citizen scientist boaters to use while they are out on the water to test the turbidity in different areas of Lake Erie. Coming soon! We will likely be looking at Scajaquada Creek for this project. We are looking for Students.